Book Adventures: (MG) The Kindling Blog Tour & GIVEAWAY! (MG) The Kindling Blog Tour & GIVEAWAY! Welcome to Book Adventures' stop on The Kindling blog tour! For other tour stops, please click on the banner above. For a chance to win an eCopy of The Kindling, enter at the end of this post. Also, for mentions of food, scroll down. The Kindling by Braden Bell, just released July 10th, is the first in the Middle School Magic series published by Cedar Fort Books. Book two is in the works and is tenatively titled Penumbras. Braden is also the author of The Road Show published in 2010. Aside from being an author, Braden teaches music and theater at a private middle school in Tennessee (heavy inspiration for The Kindling). All thirteen-year-old Conner Dell wants to do is pass pre-algebra, play lacrosse, and possibly kiss Melanie Stephens. He didn’t mean to set anyone’s gym shorts on fire or make school lunches explode. But now that the strange powers inside him have been ignited, Conner’s normal teenage life is about to go up in flames! Braden Bell has done a great job at creating story both rich and intriguing, especially for the target audience (middle school kids). The magic system, taking much from Christian belief--especially the Latter-day Saint faith, is well thought out and entwines itself very well with the plot and characters. The main characters are three thirteen year-olds, two girls and a boy, who are intermittently commendable and frustrating, but the characters that I found most interesting where the teachers. I am left feeling very curious about their backgrounds. The only issue that stood out to me on the con side of The Kindling was the quickness with which the theme of depression and hopelessness was both introduced and dealt with. It seemed to get sucked into the climax of the story and I was left feeling flat about it. It didn't feel authentic. Aside from that, The Kindling is a "giantly" (as Lexa would say) fun ride with mystery, twists, and magic (that is really not magic, but Mr. Timberi will explain that later). Some of the action takes place at school, some at home, some in the "It's a Small World" ride at Disney World, and some in an undisclosed location with a sinister laboratory. The Kindling is a great first installment and I'm curious as to where the next adventure will take us. Pizza. Pizza is most definitely the main food in The Kindling. I would tell you more about the different appearances of pizza in the book, but then I'd spoil parts of the story (oops! Maybe this kind of spoils it too). I'll just say there are three instances; two delivery and one involving many ((flying)) individual frozen ones. So if you want to have a dinner to go along with The Kindling, serve pizza. Braden say's, "Pepperoni pizza--mostly. Conner and Lexa love it. Melanie is a fairly picky eater and is going through a vegetarian phase, so she only eats plain. So, the pizza delivered was half-pepperoni and half plain cheese. 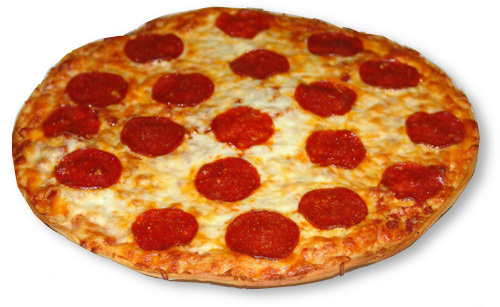 The pizzas at school were frozen individual pepperoni pizzas (although I'm sure they had some plain as well)." Other foods mentioned are chocolate chip cookies which the little sister to one of the main characters makes in a very special place, and rice pilaf. Pilaf becomes the permanent nickname of a side character who I have a very strong suspicion will become a more prominent character in the next book. Mentioned with the rice pilaf is meatloaf and mixed vegetables, but it's probably best to stick with the pizza. Drink-wise, Diet Dr. Pepper and Lemonade ((which you can make with honey instead of sugar)) are mentioned. Aside from water, of course. Now please enjoy this trailer for Braden Bell's The Kindling! Thanks Diana! Thoughtful review and the food aspect is a fun touch. Just wanted you to know that the sequel to The Kindling came out--and it has lots and lots of food in it!